A wheeled cornucopia goes down our street every day, with vendors selling everything ripe and local out of the backs of their trucks. In the summer, I can step out of the gate and buy mangoes by the kilo. Until then, I have to walk a block to the nearest store for mangoes coming from further south. Until we moved to Mexico, I never knew the aroma and taste of mangoes picked ripe and juicy. And the variety! 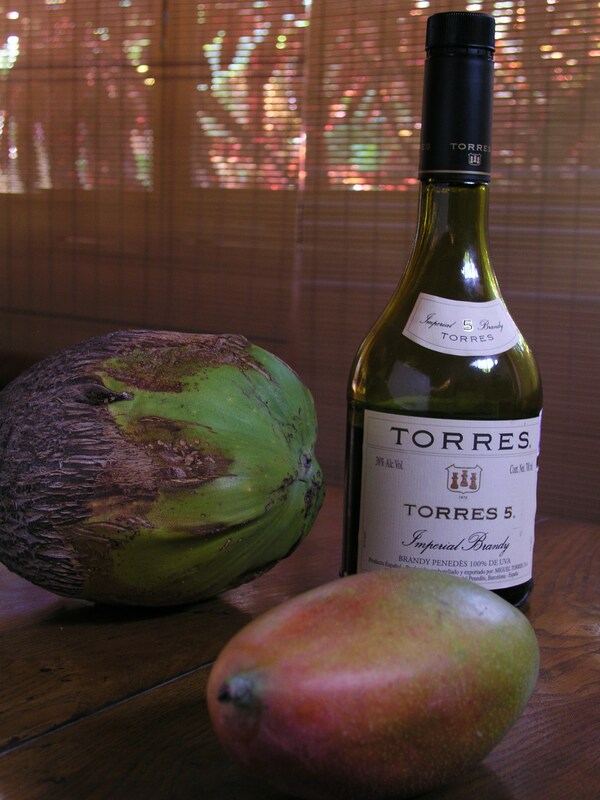 The common Tommy Atkins, known familiarly as “Tommy” in Mexico, the luscious Ataulfo, also called the Champagne mango, the large, firm Haden, the Keitt, still green when ripe, and the Kent mango, almost fiberless. These are the common mangoes of Mexico, exported by the ton, maybe coming this summer to a supermarket near you. When you find some, eat them raw and fresh, standing over the sink — or better yet, in the surf — so as not to drip the staining juices on your shirt. If there are any left over, make Mango Coconut Tres Leches Cake. Tres Leches cakes are the cake of Mexico. Probably of European origin, this cake is known for its high moisture level, due to its saturation with three milks — condensed milk, evaporated milk and cream. Some think it is too wet. Well, that is part of its charm. If it wasn’t wet, it wouldn’t be a tres leches cake, just another white frosted cake. My cakes are hardly ever white, nor are they overly sweet. As in many of my baking recipes, this one has whole wheat flour and decreased sugar. It also has coconut oil instead of butter and coconut milk instead of dairy milk. The inspiration came from a recent recipe in the New York Times for Mango Tres Leches Cake. Its addition of Spanish brandy is a touch of genius. This was one of those rare times when I actually had an uncommon ingredient on hand, thanks to Costco. If you don’t have Spanish brandy, cognac is fine. If you don’t have cognac, the cake will still be very good. Butter a 9-inch-by-13-inch (23 cm. x 33 cm.) baking pan; heat oven to 350 deg. F. (180 C.). In a medium bowl, sift flour, baking powder and salt. Stir in 1/2 cup sugar. In a large bowl, stir together egg yolks, melted coconut oil, 3 tablespoons coconut milk and vanilla. Beat egg whites until frothy, add cream of tartar. Before peaks form, add 1/4 cup of sugar, 1 tablespoon at a time, beating until slightly stiff. Whisk half of flour mixture into yolk mixture. Whisk in 1/4 egg whites. Carefully fold in another 1/4 egg whites with a large spatula or balloon whisk. Sift half of remaining flour mixture into batter, and fold in. Fold in 1/4 egg whites. Fold in remaining flour mixture. Fold in remaining egg white. Do not over-mix. Spoon batter into prepared pan, smooth top, and bake 25 minutes, or until center tests dry with a wooden toothpick. Cool on a rack. In a small pan, heat coconut milk, condensed milk and brandy until hot. Pour over cake. Cover and chill cake for at least 3 hours or overnight. Puree mango in a food processor until smooth. Add additional sugar to taste if the mango is not sweet. At serving time, whip cream until stiff. Fold in half of mango puree. Spread mango cream over the cake. Spoon remaining puree on top and swirl into whipped cream with a spatula. ~ * After sifting, you should have 1 1/2 cups of flour; save bran for muffins or bread. ~ When whipping cream, especially in the summertime, use very cold cream, and pre-chill the mixing bowl and beaters in the freezer. This will prevent you from unexpectedly making butter instead. ~ Use organic ingredients when possible. This minimizes our exposure to pesticides and herbicides, as well as lessening contamination in water and soil. The Coconut Mango Tres Leches Cake was made with organic coconut milk, organic coconut oil, organic sugar, eggs from free-range chickens and locally grown, unsprayed mangoes. It was my birthday this week and I gave myself the same present I give myself every year. I baked a cake. This year it was a coconut chocolate cake, something I’ve been thinking about making for a while. Something else I have been thinking about is how to incorporate more coconut oil into my cooking. I have found that its subtle flavor adds a pleasant note to anything Asian, like stir-fries and curries. It also makes a good substitution for butter or vegetable oil in baking. Despite long held prejudice by many in the food industry, coconut oil has recently been found to be a superior oil to use in baking and cooking. Our history with coconut goes back a long way, when we first started visiting Mexico. We once came close to becoming petty criminals when we purchased two coconuts with the tops lopped off, straws inserted, somewhere on a hot plaza in Mexico. As we wandered off, contentedly sucking on the cool, refreshing liquid, we were sternly called back by the vendor and informed that we had only purchased the coconut water, not its meat. We meekly stood in front of her and finished the water while she eyed us suspiciously, then handed the coconuts back to her. She, no doubt, had plans for her coconut meat, either to use in cocadas — coconut macaroons — or to sell it dried and shredded. We had had plans for the meat, too, but she effectively laid them to rest. Back to my coconut chocolate cake. As it was my birthday and I didn’t want to spend all day in the kitchen, I used a quick chocolate cake recipe found on a can of Hershey’s cocoa some years back. But the recipe was only for inspiration. Sifted whole wheat flour was used instead of white flour, the sugar was halved, coconut oil stood in for vegetable oil, and dry, unsweetened coconut was added. The cake turned out moist, tender and redolent of coconut. There is no such thing as too much of a good thing when it comes to coconut. Pre-heat oven to 350 degrees F. (180 deg. C.). Butter and flour two 9-inch round cake pans or one 13×9-inch pan. Stir together sugar, flour, coconut, cocoa, baking powder, baking soda and salt in bowl of standing mixer. Stir in boiling water. Batter will be very thin. Cool on racks for 10 minutes; remove from round pans. Rectangle cake can be left in pan. When completely cool, dust with powdered sugar. *I under-bake chocolate cake by about five minutes for a very moist center and more intense chocolate flavor. If you under-bake, the knife blade will not be completely clean when the cake is tested for doneness. Some organic ingredients are easy to find in Mexico. Others, like whole wheat flour, are non-existent. Use what is available and what you can afford if you are concerned, like me, about chemicals in our foods. Coconut oil contains no cholesterol, but does have saturated fat. What nutritionists are learning is that not all saturated fat is the same. Some are better than others, and some are actually healthy, such as the lauric acid (saturated fat) in coconut oil. If you buy coconut oil, do not buy any with the letters RBD on the label. This stands for Refined, Bleached and Deodorized. This is nasty stuff, containing chemical residues that were used in processing. RBD oil has no coconut taste or aroma. Lent has arrived in the Catholic world, Mexico included. This period of time marks the days between Ash Wednesday and Easter Sunday, and many Mexicans observe Lent by not eating meat and preparing certain dishes seen only at this time. I am not Catholic, but I appreciate Lent as a time to try different foods and recipes. This is the only time empanadas filled with tuna fish and canned peas make their appearance in the bakery departments of the big supermarkets. When we first tried this — and obviously we will try just about anything — we weren’t so sure about the taste combination, but now Russ and I look for this odd snack when we go grocery shopping during the days and weeks leading up to Easter. Torta de Garbanzo is another unusual Lenten dish with sweetened, ground beans, more reminiscent of an Asian sweetmeat than something you would find in a Mexican cookbook. During our travels years ago, we visited friends in Sayula, Jalisco. Antonia and José Ojeda welcomed us warmly and fed us well. Antonia’s six-year old granddaughter was the young girl I mentioned in yesterday’s review of Taco Cuervo, when I wrote about trying to make perfect tortillas. She had laughed and laughed at my dismal results. Now she had another opportunity to see me in action, and must have anticipated the entertainment I would unwittingly give her this time. We arrived at the beginning of Lent, and Antonia, knowing of my keen interest in the local food, asked me to help her make Torta de Garbanzo. This is the kind of opportunity I dream of — working with an excellent Mexican cook in her own kitchen, making one of her recipes. Somehow, I had the presence of mind to write down the recipe as I watched and helped. Antonia brought out her metate, the heavy, stone tablet on which corn, cocao beans, and, in this case, cooked garbanzo beans, are ground to a flour or paste. She showed me, in a few efficient moves, how to grind the beans, and I went to work. The soft garbanzo beans turned to mush in no time, but when she added the almonds and broken cinnamon bark, I felt my arms start to tire. I thought of my nice Cuisinart food processor back in my kitchen, as well as every other appliance and gadget that makes cooking easier. The burning muscles and sore knees — yes, we were on the floor working — brought me up short. Here was Antonia, my senior, making quick work of this, while I failed to grind every bit of cinnamon bark until it disappeared into the garbanzos. She had to finish the job. If her granddaughter were around, she probably got another laugh, if not a snicker, from my performance. Today, I’m making Antonia’s Torta de Garbanzo again, but the Cusinart is doing the grinding. I’m still a wimp. I halved Antonia’s recipe, and now after eating a slice, I wish I had made the full amount. I also decreased the sugar, using brown sugar instead of panela, the hard, unrefined cones of dark sugar that also gave me sore arms that day. And where does a gringa like me find natas, the skin formed on boiled milk that is skimmed again and again until there is enough for a recipe? I used evaporated milk and it worked, but next time I’ll make natas. Antonia would approve. Almonds were blanched and skinned, and raisins were de-stemmed — the sweet, fruity, almost purple raisins I bought at Teresa’s store here in La Cruz still had some stems attached. Pre-heat oven to 350 deg. F. (180 C.). Generously butter an 8″ round baking dish. In food processor, puree beans, sugar, cinnamon and almonds. Add milk and egg and process until smooth. Spoon into baking dish and dust top with additional cinnamon. Bake for 25-35 minutes, or until firm. Cool for at least one hour before serving. Garnish with crema and cajeta. If you double the recipe, use a 9″ baking dish. Pour boiling water over almonds to blanch. Remove from water after thirty seconds, and squeeze to pop the nut out of the skin. Cajeta, also known as Dulce de Leche, is caramelized goat or cow milk. It was called for in the original recipe, but instead of adding it to the other ingredients, I spooned some over the crema when the torta was served. José Ojeda is one of Mexico’s most famous knife makers. For thirteen generations, his family has been making high quality, award winning hunting and kitchen knives. The cuisine of Mexico is built upon foods that originated in the New World: beans, corn, chile, tomatoes, avocados, squash, chocolate. These are some of the first foods of the first people of Mexico that still form the basis of the most common dishes of Mexico. Coconut is thought to have been cultivated in Mexico when it was brought from the Philippines in the 16th. century. Even though it has been here for almost five hundred years, that is too recent for it to be ingrained in the Mexican food culture. This is a country whose civilization goes back to the Olmecs, who lived in Central Mexico as early as 200 B.C. Something that showed up only five hundred years ago does not rate as an established ingredient. It is too new. For coconut bread to make an appearance in Mexico, wheat, another recent newcomer, had to be introduced. The final necessary element was the craft of baking, brought to Mexico by Spanish nuns. Coconut, wheat and baking. With all three present, coconut bread can happen in my kitchen in Mexico today. OK, I already knew how to bake, thanks to my European heritage and my American mom, but if I were a mexicana, I would be thanking the nuns right now. Epicurious, a favorite recipe source, inspired my coconut bread, but I made a lot of changes: whole wheat flour, vanilla (another Mexican native), organic, unsweetened coconut instead of sweetened, coconut oil instead of butter. Epicurious describes this bread as being very crumbly and suggests waiting a day before slicing it. Right. Once the kitchen is bursting with the aroma of freshly baked coconut bread, we are going to wait twenty-four hours before we cut into it? There may be others stronger and more disciplined than we are. We went for warm coconut bread, crumbs and all. Russ can always be counted on for a few interesting comments about whatever is set before him on our kitchen table. With an amazing palate and high culinary standards, he doesn’t mince words if something doesn’t measure up. When asked what he thought about the coconut bread, he said one word: good. And then he repeated it, mumbling because he had his mouth full. You get the idea. It is good. We spread warm slices with Walnutella, a new recipe still in development. Pre-heat oven to 350 degrees F. (180 C.). Oil and flour a 9″ x 5″ (12.7 cm. x 23 cm.) bread pan. Grind 3 cups (7.5 oz./230 grams) of coconut into a fine meal in a food processor. Beat coconut oil and sugar with an electric mixer until smooth and creamy. Add eggs, one at a time, beating until incorporated. In a large bowl, combine ground and unground coconut, flour, baking powder and salt. Stir dry ingredients into egg mixture until combined. Do not overmix. Spoon into loaf pan and smooth top. Sprinkle one teaspoon of sugar on top of batter, down the center of the loaf. Bake for 1 hour, or until a toothpick inserted in center tests dry. Cool in pan for 15 minutes. Turn out of pan and set right-side-up on a rack to cool for 2 hours. Slice into 1″ (2.54 cm.) thick slices to minimize crumbling. Coconut is big in our kitchen and garden. With six coconut palms we have all the coconut we can handle, plus some, so thinking about coconut recipes happens often. This week I found a recipe from Australia for coconut bread that came with high praise for renowned Sydney restaurateur, Bill Granger. I adapted the recipe with my usual changes: decreased the sugar and used whole wheat flour. And I used coconut oil instead of butter. Then I turned the loaf into muffins. I can’t help myself — I have to fiddle with every recipe. Coconut muffins are especially good warm out of the oven, or sliced and toasted the next day. About twice a year, our coconut palms are trimmed. This is a bonanza, as we eat coconut meat, drink coconut water, make coconut milk, freeze coconut, cook with milk and meat, give them away — do everything we can to deal with over a hundred coconuts. One year we cut down a coconut palm that was too close to the roof and causing damage with the falling nuts. You’ve heard of hearts of palm? Well, there is nothing in the food realm to compare to hearts of coconut palm. It was like eating ambrosia. I am considering planting more palms just to be able to harvest the hearts. If I have the urge for fresh coconut water when Russ isn’t home to open one for me, I struggle with the machete to open one myself. If you only know coconuts from the grocery store, you might not know that each nut has a thick, tough husk of fiber enclosing it, which has to be cut away before the top can be lopped off. If this urge occurs during the summertime, when our humidity is in the 80-90% range, I’m soaking wet and desperate for a cold shower by the time I get it open. And wondering why I had to open this thing in the first place. One swallow of the cool, refreshing, invigorating nectar of the gods … I could go on and on like this … reminds me how much I love coconut water. Someone just told me she uses a wine opener, the kind with the spiral screw to pull out a cork. Screw in the opener. Pour out the water. This is genius! Now I’m eyeing our coconuts to see which will be the candidate for the first wine opener opening. Pre-heat oven to 350 deg. F. (180 C.). Oil muffin pan or use paper muffin or cupcake liners. Sift flours, baking powder, cinnamon and salt. Stir in sugar and coconut. Stir egg mixture into dry ingredients until just barely combined and a little bit of dry flour is visible. Don’t over-mix. Quickly blend melted coconut oil into batter. Again, don’t over-mix. Divide batter among muffin cups for 12 large muffins or 18 medium ones. Bake about 25-30 minutes, or until muffin tests dry with a wooden toothpick. Cool for 10 minutes in pan. If you want a bit of sparkle, sprinkle tops with coarse sugar, then move muffins to rack to cool. Best eaten while warm. The paper muffin cups in Mexico are larger than those I buy in the States. If you have standard cupcake papers, make 18 coconut muffins.You will get 12 muffins if using the larger, Mexican muffin papers. Mexico imports its cinnamon (Cinnamomum zeylanicam), also known as “true cinnamon”, from Sri Lanka. This is different from the ground cinnamon, known as cassia (Cinnamomum cassia), found in US stores. Cassia is a hard stick, and can not be ground in your spice grinder. True cinnamon is soft, rolled bark, and can be ground in a home spice grinder (read “recycled coffee grinder). It is described as being sweeter and more delicate in flavor than cassia. It is also lighter in color. The two are similar, but can be distinguished. Apparently the US Food and Drug Administration does not make this fine distinction, and ruled that cassia can be labeled and sold as cinnamon in the US. Look on the label of your cinnamon container. It should tell you which one you really have. And look for Cinnamomum zeylanicam, the true cinnamon, next time you shop.